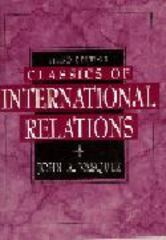 Classics of International Relations 3 Edition Innovative in its mixture of classic and contemporary readings by our greatest thinkers and scholars, this highly reputable and popular book provides one of the best single analyses and introductions to the most enduring questions of international relations. Now updated with many selections from the 1990s, the collection examines: 1) the relationship between morality and politics; 2) whether international relatio ns can be a science; 3) the nature of foreign policy and global conflict; and 4) how to create lasting peace, with a special focus on how to build and maintain peace in the post-cold war era. Links the thought of the past with the r esearch of the present, including choice work from Western civilization and the best articles of the discipline published in the last 60 years. Contains classic readings from the 1980s and 1990s reflecting the major intellectual currents having a profound effect on the field, with new articles on conflict resolution, the new world order, feminist approaches, t he third debate and post-modernism, and democracy and peace. For professionals in t he international relations field; recommended for Fulbright teachers and USIS cultural centers and libraries.